Argentinos eat gnocchi together on the 29th of every month, and it’s a national holiday. Argentinos are fond of the expression ‘a full belly, a happy heart,’ and on the 29th they prepare Ñoquis (as they spell it) at home and invite friends over to share the meal; it’s also quite common to find ñoquis on the menu in restaurants on this day. Either way, diners end up both full and happy. Traditionally, money is placed under the plate to attract prosperity. The money is kept by the diner as a good luck charm, is left for the hostess to pay for the gnocchi for the following month, or can be given to a member of the party who is in need. There are a number of stories about how this tradition got started. Italian immigrants (whose descendants make up about 50 percent of Argentina’s population) may have brought this tradition with them. Some say that an Italian saint named San Pantaleon, one of the patron saints of Venice, was canonized on the 29th, each month this day is celebrated as his feast day. The goal (and the challenge) of good gnocchi is that it should be light and fluffy while also dense enough to have flavor, but not so dense that they are chewy or gummy. There are a variety of ways to ‘mark’ the gnocchi-all just a style choice, since at this point, they are more or less done. Here are some suggestions: Mark an indentation in the center of each gnocchi with your index finger; or roll over the side of a cheese grater to make patterned indentations; or roll over the backside of a fork, or roll over the center of a wooden gnocchi tool. What a riot! How fun! And what beautiful gnocchi! Wish I could come over tomorrow and enjoy it! I have tried to make it and wasn’t impressed. Try, try again, no? I love the tradition – great idea! I love any tradition where money is hidden under the plates! Thanks for the good info — I’d never heard of this gnocchi holiday before. These look so soft and melt in your mouth good! Ours were rather dense and tough, but you’ve inspired us to try it again. Thanks! BTW- our first cooking video is up! Wow, you’re right! 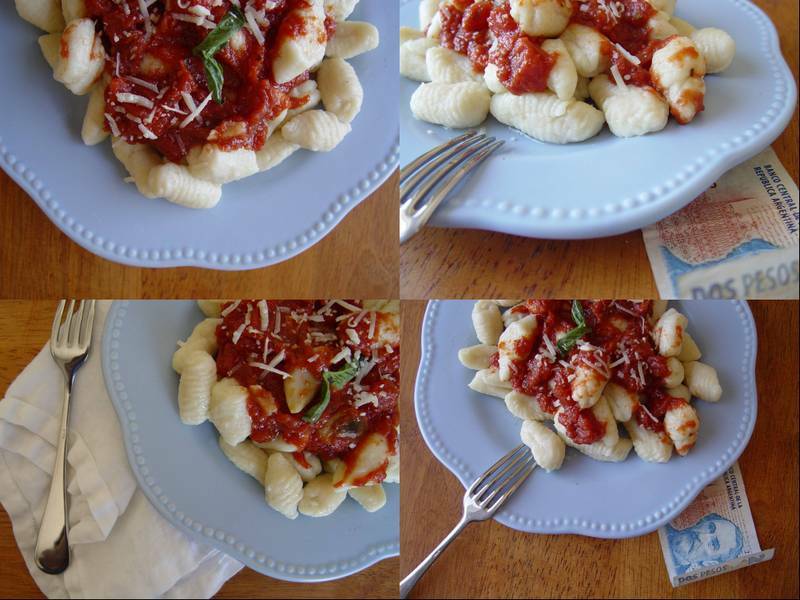 Any country with a national gnocchi day is a winner! Actually, I already love Argentina as one of my best friends grew up there…one more reason to love it! I have yet to master gnocchi. The two times I’ve made gnocchi have yielded errors on both ends of the spectrum. 2008 is my personal Year of the Dumpling and gnocchi, to be sure, is on the long list. While I firmly believe that there is no bad gnocchi, my favorite topping for them is walnut-sage pesto, but I’d never turn down a pan-fried, no-sauce version. THANKs for your blog! Good to know we can have Ñoquis every month and celebrate how good they are!